This is a very beautiful plant!!! A nice candid white monstrous form that looks like Mammillaria luethyi!!! 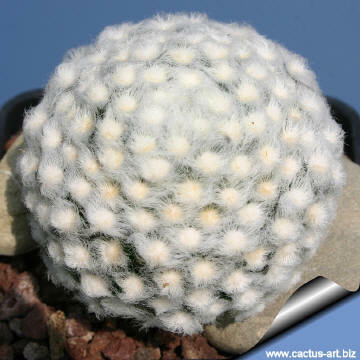 Description: Mammillaria shiedeana var. 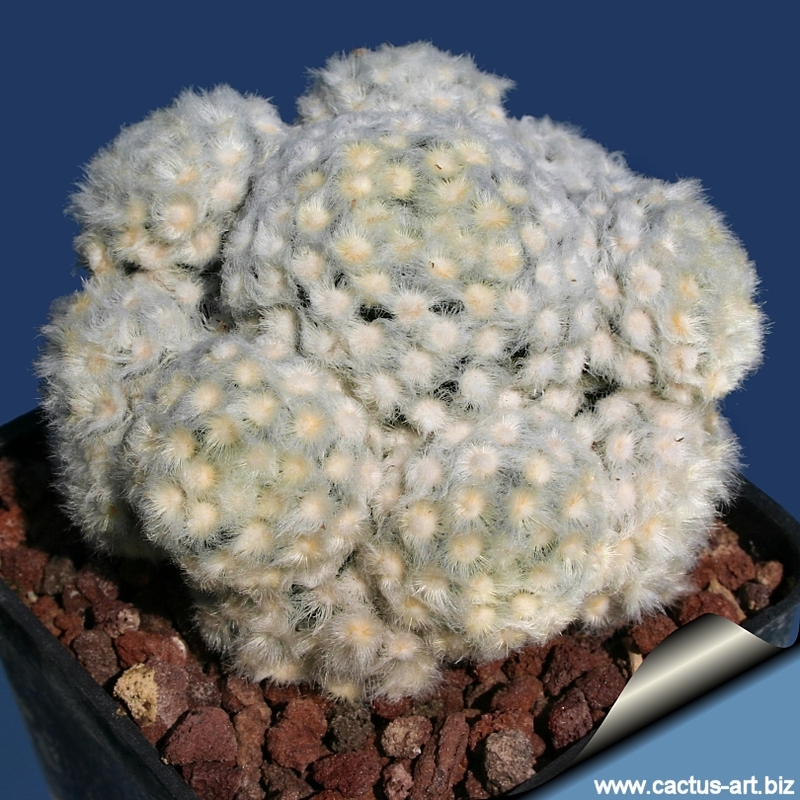 plumosa forma mostruosa is a clumping cactus, that may forms large groups of little globes covered entirely in even longer shining-white, soft, silky hairs, it is generally considered to be more difficult and slower in growth than the standard species and often must be grafted. Stem: Spherical or compressed globular, green, up to 5 cm wide or more. Areoles: Roundes white to golden-yellow. Spines: Its special appeal is due the beautiful white, feathery looking spines. 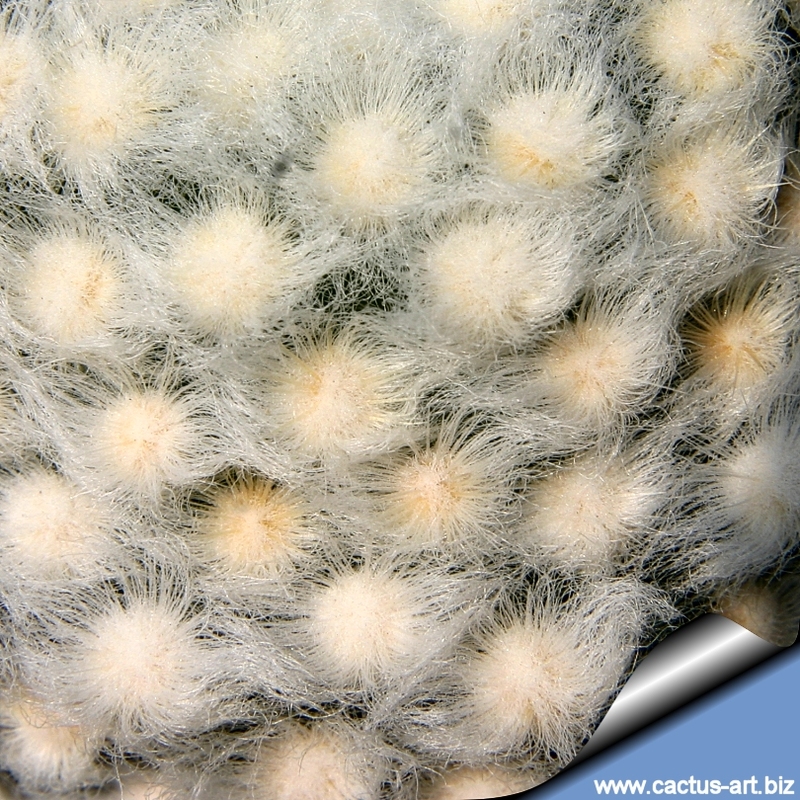 Central spines absent radial spines many (100-120 or more) in several series, very thin, silky, spreading radially, 2-4 mm long, spines are a an almost pure candid white colour, eventually with a shine of golden-yellow at the base near the areoles. The name plumosa means 'feathery'. Cultivation: It is a slow growing species of easy culture, recommended for any collection, it doesn't require any special treatment. 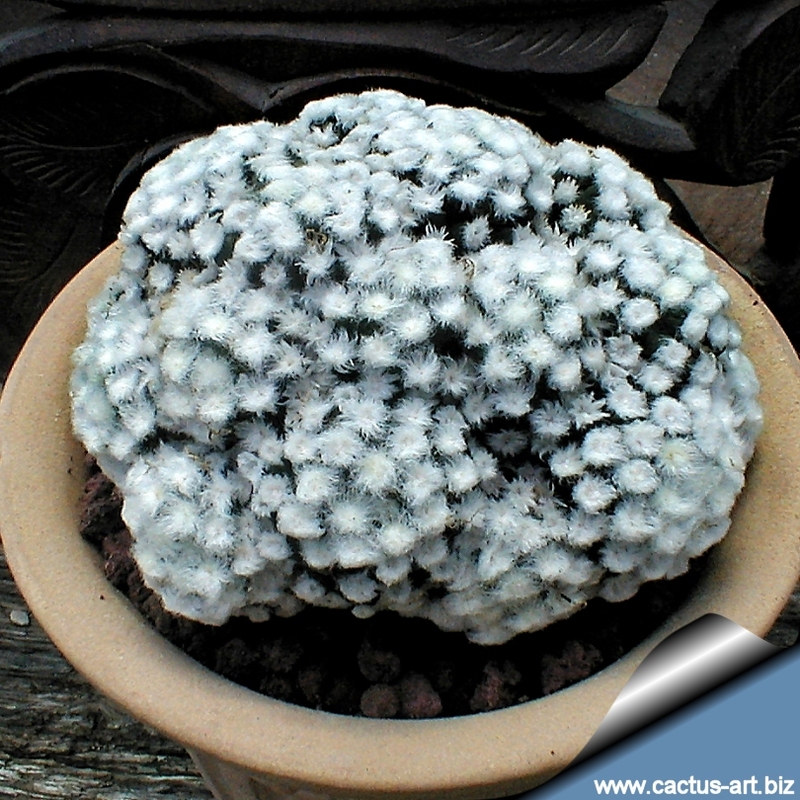 Water regularly in summer, but do not overwater (Rot prone) Use pot with good drainage and a very porous potting media, keep dry in winter. Feed with a high potassium fertilizer in summer. 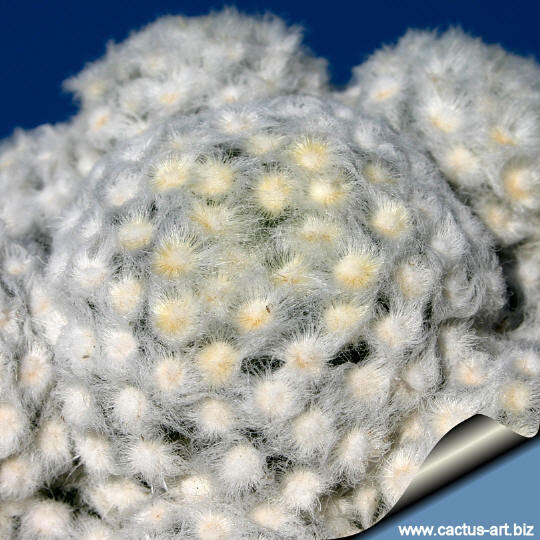 It is quite frost resistant if kept dry, hardy as low as -5° C (some reports give it hardy to -5°C) Sun Exposure: High levels of light are needed to flower and for good spine development. Can be sunburned if moved from shade/greenhouse into full sun too quickly. During the spring it may be able to take full sun until the heat arrives at the end of spring. In an area that has hot afternoon sun, it may be able to take full morning sun, but requires afternoon shade or afternoon light shade. If grown correctly, it will reward the grower with generous displays of purple flowers. 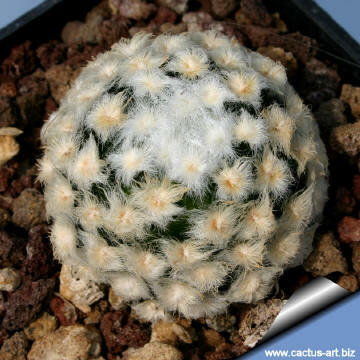 Clustering in cultivation after several years and easily flowered. 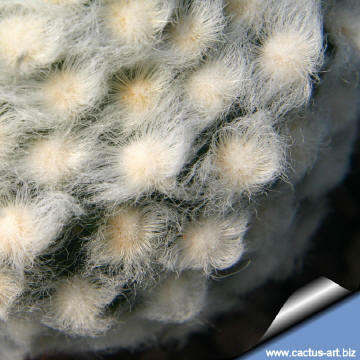 For best results, use a shallow pot, and only use the smallest diameter pot that will accommodate the plant. Propagation: Grafting or division, wait until the offsets that appear at the base of old clustered specimens are 1/3 the size of the parent and then detach and plant. Mammillaria schiedeana ssp. giselae "albiflora"